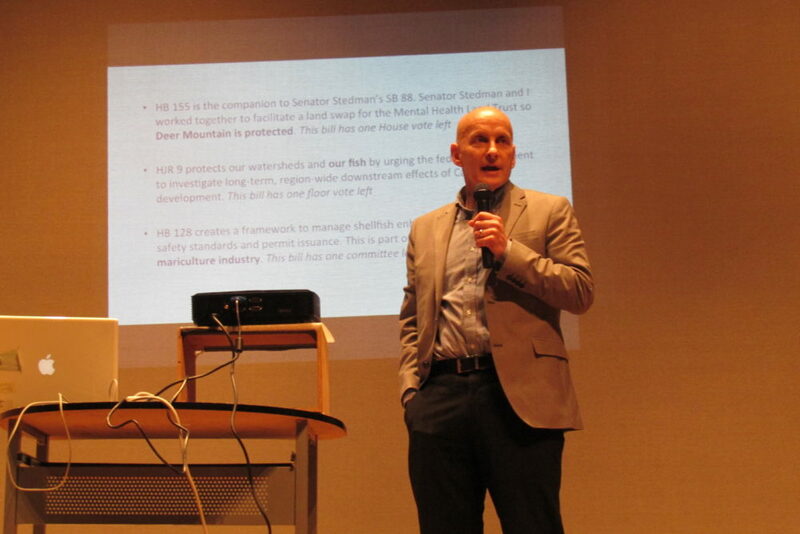 Representative Dan Ortiz at a town hall meeting in Ketchikan, April 20. Representative Dan Ortizheld a town hall meeting in Ketchikan Thursday night. Ortiz shared the details of a fiscal plan to address declining State revenue, and gathered input from constituents. After speaking about legislation he’s introduced or co-sponsored, Ortiz discussed the State budget crisis, and House and Senate proposals to address the fiscal gap. He was joined by Pat Pitney, budget director for the State of Alaska. Ortiz says the State can no longer rely on savings, and needs a buffer in case there is an emergency. He explained the four components of the House’s plan – reducing this year’s budget by $82 million, reforming the current oil tax-credit system, restructuring how the Permanent Fund is managed, and establishing a broad-based tax that would generate at least $650 million annually once fully implemented. To illustrate the extent of the State’s fiscal crisis, Pitney used the example of a person who was earning $80,000 a year now having to live on $16,000 annually. She says you can cut out non-essentials, tap into savings, and draw from your retirement account, but that is still not enough. 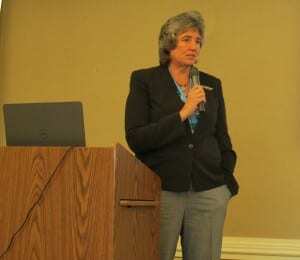 State Budget Director Pat Pitney speaks during Southeast Conference in Prince Rupert, BC, Sept. 16 (KRBD file photo). 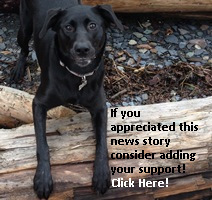 Pitney says State funding to Ketchikan municipalities totals about $31 million. This includes funding for schools, school debt, and public employee retirement. After a one-hour presentation explaining the situation and proposals, Ortiz asked the audience to share questions or comments. Under the House’s current plan, the proposed broad-based tax would be an income tax. A few people spoke in support of an income tax, one suggesting that it have a sunset clause. Several others spoke against an income tax, saying it taxes only one segment of the population, the working people. Wayne Phillips says an income tax will also hurt retirees. Some oppose a sales tax, saying it would hurt those with lower incomes. Several people, however, spoke in support of a summer sales tax. If there has to be a sales tax, a few people say necessities, such as food and rent, should not be taxed. Rodney Dial does not support taxes, and feels more State cuts are needed. Dial was one of several people who questioned why organized boroughs and urban areas are required to pay taxes, while rural areas are not. A woman identifying herself as a paraprofessional in the school district feels there are areas in education funding that could be cut. 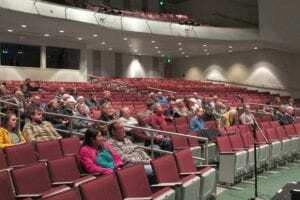 Constituents listen to a presentation by Rep. Dan Ortiz at the Kayhi auditorium. Other concerns expressed were funding for the Alaska Marine Highway, social services and Pioneer homes. Ortiz says while sales and income taxes may not be popular, something has to be done. Ortiz says now the Senate and House proposals will go into conference committee where there will be discussions and compromise. He says he can’t guarantee the process will work, but believes an agreement will be reached. Ortiz says if the final plan doesn’t add revenue, there will be additional cuts to education, health and human services programs and others.